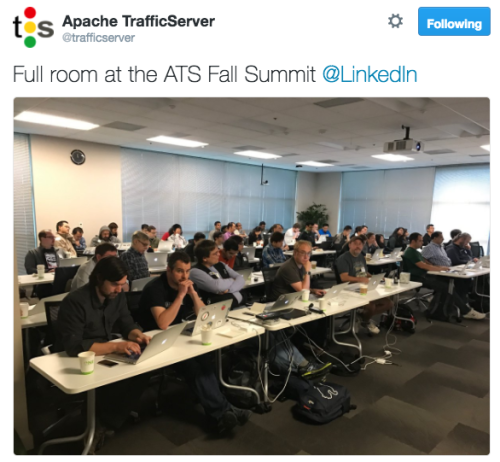 Last week, the ATS Community held a productive and informative Apache Traffic Server (ATS) Fall Summit, hosted by LinkedIn in Sunnyvale CA. At a hackathon during the Summit, we fixed bugs, cleaned up code, users were able to spend time with experts on ATS and have their questions answered, and the next release candidate for ATS 7.0.0 was made public. There were talks on operations, new and upcoming features, and supporting products. More than 80 people registered for the event and we had a packed room with remote video conferencing. I have been attending the ATS Summits since their inception in 2010 and have had the pleasure of being involved with the Apache Traffic Server Project for the last nine years. I was also part of the team at Yahoo that open sourced the code to Apache. Today, I am honored to serve as the new Chair and VP of the ATS Project, having been elected to the position by the ATS community a couple weeks ago . Traffic Server was originally created by Inktomi and distributed as a commercial product. After Yahoo acquired Inktomi, Yahoo open sourced Traffic Server and submitted it to the Apache Incubator in July 2009. Since graduating as Apache Traffic Server (an Apache Top-Level Project as of April 2010), many large and small companies use it for caching and proxying HTTP requests. ATS supports HTTP/2, HTTP/1.1, TLS, and many other standards. The Apache Committers on the project are actively involved with the Internet Engineering Task Force (IETF) – whose mission it is to “make the Internet work better by producing high quality, relevant technical documents that influence the way people design, use, and manage the Internet” – to make sure ATS is able to support the latest standards going forward. Many companies have greatly benefited from the open sourcing of ATS; numerous industry colleagues and invested individuals have improved the project by fixing bugs and adding features, tests, and documentation. An example is Yahoo, which uses ATS for nearly all of its incoming HTTP/2 and HTTP/1.1 traffic. It is a common layer that all users go through before making a request to the origin server. Having a common layer has made it easier for Yahoo to deploy security fixes and updates extremely quickly. ATS is used as a caching proxy in locations worldwide and is also used to proxy requests for dynamic content from remote locations through already-established persistent connections. This decreases the latency for users when their cacheable content can be served, and connection establishments can be made to a nearby server. The ATS PMC and I will focus on continuing to increase the ATS user base and having more developers contribute to the project. The ATS community welcomes other companies’ contributions and enhancements to the software through a well-established process with Apache. Unlike other commercial products, ATS has no limits or restrictions with accepting open source contributions. Moving forward, we would also like to focus on three specific areas of ATS as a means of increasing the user base, while maintaining the performance advantage of the server: ease of use, features, and stability. I support the further simplification of the configuration of ATS to make it so that end users can quickly get a server up with little effort. Common requirements should be easy to configure, while continuing to allow users to write custom plugins for more advanced requirements. Adding new features to ATS is important and there are a lot of new drafts and standards currently being worked on in IETF with HTTP, TLS, and QUIC that will improve user experience. ATS will need to continue to support the latest standards that allow deployments of ATS to decrease the latency for the users. Having our developers attend the IETF meetings and participate in the decision-making is key to our ability to keep on top of these latest developments. Stability is a fundamental requirement for a proxy server. Since all the incoming HTTP/2 and HTTP/1.1 traffic is handled by the server, it must be stable and resilient. We are continually working on improving our continuous integration and testing. We are making it easier for developers to write testing and run tests before making contributions to the code. The ATS community is a welcoming group of people that encourages contributions and input from users, and I am excited to help lead the Project into its next chapter. Please feel free to join the mailing lists, attend one of our events such as the recent ATS Summit, or jump on IRC to talk to the users and developers of this project. We invite you to learn more about ATS at http://trafficserver.apache.org.